Clearly a lot was achieved at the workshop. The pieces are stunning. Meanwhile on Tuesday, the first social stitching afternoon, mooted at our January meeting, took place at the Bowling Green cafe in Castletown. Eight members turned up, which is a good number. Some continued with their piece from the Origami Twist workshop and others made progress on work, which they had on the go. 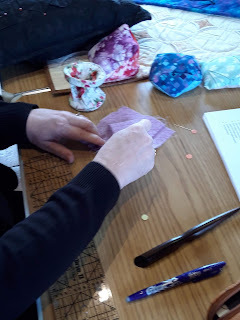 It was a very pleasant afternoon in a light and warm environment and we actually had time to chat over our stitching, unlike at workshops, where concentration on the task in hand is paramount! Lis Binns titled her chatty talk, “In at the Deep End” because, when she started quilting, she didn’t start with basic squares but with challenging, technical quilting techniques! However, she had started stitching at the very young age of four with instruction from her mother. This was until she could read and she was then told she could teach herself! Lis made clothes and dolls but also did lots of detailed cross stitch, worked on 18 count linen. As an adult, after studying for a degree in electrical engineering, stitching was a way of relaxing. The quilting started by accident when she and her mother needed to sit down in a shopping mall and the only place to do so was a quilting demonstration, which was free! From then on Lis went on to study for a City and Guilds' course in Quilting and we were shown lots of quilts that she had made over the years, for herself, her family and friends, and for the City and Guilds course. Only a year or so after taking up quilting, her entry into a competition at the NEC Quilt Show won third prize! The competition was for 12 small quilts made one per month, so all were very different and reflected what was going on in her life during that month. 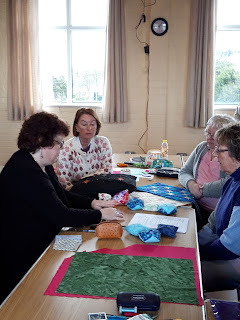 Lis gave us an illustrated talk with photos and followed up by showing us a selection of quilts and smaller quilted pieces which she had made – we were all in awe! Lis is a very thorough tutor. She explained the stages we would do, before we started cutting and stitching and she monitored us all as we went along. After tracing the design on to our backing fabric and applying the bonded pattern pieces to it, we started the process of applying the bonded bias tape, although this turned out to be a particularly fiddly aspect of the workshop which most of us struggled with! After lunch we continued bonding the bias outline and then got down to stitching. This was also quite fiddly, requiring stitching on the inner edge first and then the outer. Predictably, only Helen actually finished stitching completely – the rest of us have another UFO! Lis’ second, half-day workshop, was attended by 10 members and, once again, she gave lots of tips and instruction to help us all make a variety of Origami twist samples. Some are going to make a banner, others a cushion, and then others just a pincushion! Janet actually finished her pin cushion – everybody else has work in progress! is also made more difficult dependent on the fabric chosen. Lis demonstrated how to make a basic origami square and then how to adapt it in a multitude of ways by additional folding. All in all, I think everyone would agree that, while they were challenging workshops, they were also hugely enjoyable and we all got a lot out of them. A selection of completed "twists"
Hilary Cairns' talk on Friday evening about her stitching life was light-hearted and enlightening. She told us of the time her friend persuaded her to apply for the Great British Sewing Bee and she got down to the final 24 for selection but was very glad not to have been chosen, having realised that the programme was all about personality and not sewing skills and that she would have had to pay for her travel, hotels and even the fabric!! Hilary also told us about her alteration business, where some of her customers were well known Blackburn footballers. This impressed her husband and sons who were season ticket holders! When Hilary first started the alteration business she was bemused to be asked to alter a dozen pair of men's trousers to very specific requirements only to discover that, when she went to chase for payment that the customer had been stealing the trousers, one at a time from big shops, getting them altered and then selling them on! She quickly learned her lesson. Hilary's sewing is wide ranging though, from dolls and puppets, dress-making to embroidery and particularly quilting which she explained was far more skilful and exacting than dress-making. Hilary's talk was very well received - it was just a pity that so few people attended! The informative workshop was also, sadly, poorly attended, owing to a clash with the Lacemakers' open day. It did mean that those of us, who were there, got extra special attention from Hilary! She was a mine of information on zips. We had no idea how many different types there are and she clearly demonstrated how to insert them. Invisible zips, put in properly, are truly invisible! Piped cushions with neat corners are also no longer a problem. Thank you, Hilary. some finished or nearly finished covers. We were joined after lunch by an enthusiastic bunch of Young Embroiderers, who had their own project of a flower design to embellish with stitching, beads and buttons. They seemed to enjoy themselves! 9th February 2019 "Take a stitch and play with it"
A pleasing numbers of members showed up for the meeting which preceded the workshop and it was interesting to hear our Chairman's summary of the outcome of January's meeting and the positive suggestions for our way forward. Twelve ladies stayed on for the workshop. We started by watching U-tube tutorials on how to do various stitches, some of which were new to even the most accomplished members. Coral stitch was to prove very popular. The 4" squares were also brought out to show what could be done with either single or multiple stitch types. A very convivial atmosphere then developed as ladies set to with their own interpretations of the one stitch theme. There was a buzz of conversation and busyness. After lunch we were joined by 6 Young Embroiderers' and some of their mothers, who all settled down to start work on their project using lazy-daisy stitch. Samples of two of the adults' work can be seen below. The little bird is created using lines of coral stitch and a "hairy" thread. The abstract is in French knots and inspired by lichen. Betty and Maureen K's work. Our decision to step outside the "norm" and hold our January meeting at Green's Restaurant in St John's, paid off. It was attended by 17 of our 29 members with four more sending in their suggestions about the future of the group. Discussion was very positive and constructive. Everyone appreciated being able to buy drinks, cakes and delicious lunches and we hope that Green's, who let us have their room for free, also benefited from our being there. Thank you, "Green's". It also gave ladies the chance to stitch sociably at UFOs or their own endeavours, so a big success all round. Our Christmas celebrations seem to be jinxed by the weather. Last year's was cancelled because of snow, this year it was a dreadful day - pouring rain and Storm Dierdre doing her best to blow down trees and people off their feet. 10 ladies braved it and, fortunately, our numbers were boosted by 6 Young Embroiderers and their mums. Kits were provided to create a Nordic-style Christmas tree decoration and nearly everyone managed to finish and take home a hanging to go on their tree. 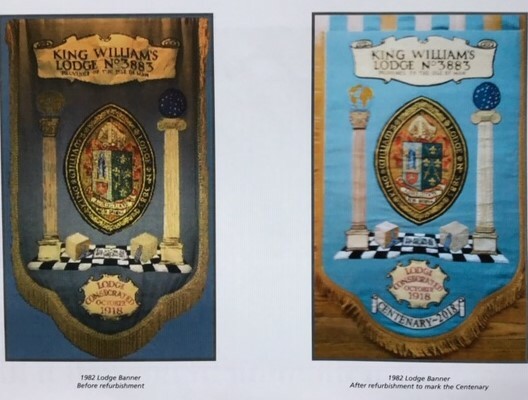 In Spring 2018 the Embroiderers' Guild IoM Branch was approached by the King William's College Masonic Lodge with a request to renovate and update their banner in time for their centenary. The work was undertaken by Helen and Jean and resulted in a nice donation for Branch Funds. The pictures are lifted from the commemorative brochure, published by the Lodge. The pictures are lifted from the commemorative booklet published by the Lodge. Saturday after meeting 10 a.m. to 4 p.m. in St. Andrew's Church Hall, Douglas, unless otherwise stated. Sat 17th November 10-11.30am Talk: "Perfection can be overrated!" Sat 15th December 1pm - 4pm Sharing Christmas Lunch. Project: Nordic felt Xmas decoration. Jean Shimmin. YE to join us after lunch. Sat 19th January 10am onwards. 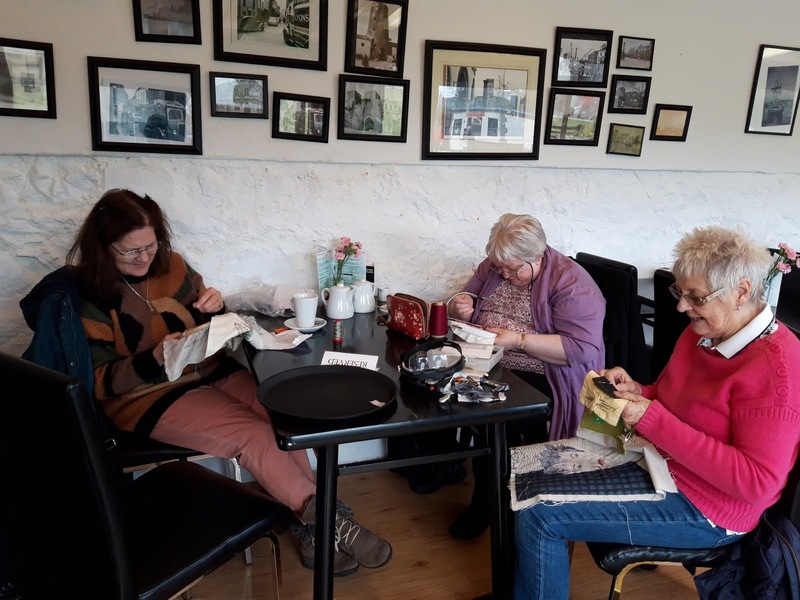 Social Stitching at Green's Cafe, St John's. Coffee and cake, Stitch and Lunch!! Sat 9th February 10am - 4pm First watch a Jan Beaney and Jean Littlejohn Stitch DVD then a Workshop "Take one stitch and play" based on the DVD. YE to join us in afternoon. Fri 29th March 7.45pm Talk "My Sewing Life" by Hilary Cairns. 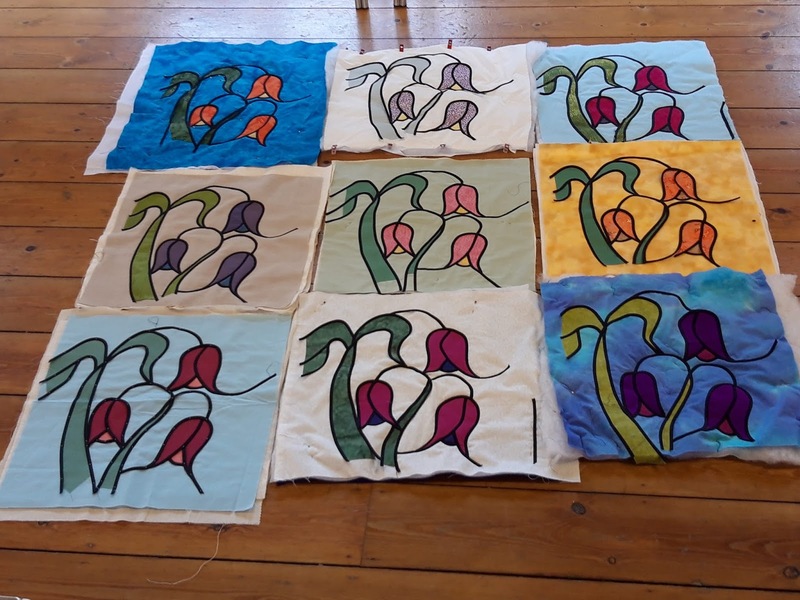 Fri 12th April 7.45pm Talk by visiting tutor Liz Binns "My Patchworking Life"
Sat 18th May 10am-4pm Workshop - Bag construction. A chance to use the Celtic panel from October 2018 or make a plain bag. Tutor, Helen Sargent. Fri 28th June - Talk. Sat 27th July 10am-4pm Jean O'Neill Charity Day. Talk about chosen charity then social stitching. YE to join in afternoon. Fri 27th September 7.45pm Open Meeting. AGM .